Corsair has announced what it calls the world’s fastest DDR4 memory, which operates at a ludicrous speed of 4,600MHz. That’s a big number, and converted into gigahertz the Corsair’s latest Vengeance LPX RAM kit clocks in at at 4.6GHz, which is faster than even some of the top processors like the Intel Core I7-7700K. Of course, comparing computer processors to memory isn't quite comparing like with like, but Corsair’s latest DDR4 kit is still damned quick. What’s even more impressive is that Corsair is achieving these speeds with its low-profile memory, rather than its traditional Vengeance DIMMs that feature massive heatsinks. The Corsair Vengeance LPX DDR4 4,600MHz beats the company’s previous speed record of 4,200MHz. Of course, computer memory this fast comes at price – it'll set you back $549 (about £410, AU$690) for 16GB kit (2 x 8GB) when it releases on September 21. 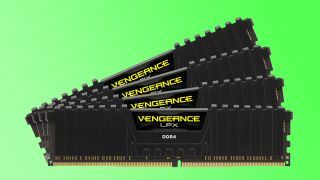 Alternatively, Corsair is also offering a slightly clocked-down Vengeance LPX DDR4 4,500MHz 16GB set (2 x 8GB) for $479 (about £360, AU$600), and it's available now.